Oscar Freire received the crown of Milan-San Remo king for a third time today. The Spaniard kept hidden for the entire day, showing his orange Rabobank colours when it counted, in the final 200 metres. “You always suffer in a race, above all when you race 300 kilometres. My most difficult moment was the descent on Poggio. 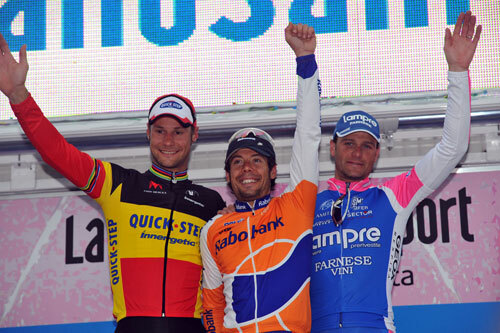 [Filippo] Pozzato created a gap and four or five went ahead, I was afraid they would survive,” said Freire. Freire saw Pozzato caught with 1,200 metres to race and remained positioned for the sprint. It paid off, he won, beating Belgian champion Tom Boonen (Quick Step) and Italian Alessandro Petacchi (Lampre-Farnese Vini). With his third San Remo win, the 34-year-old has equalled his wins in the World Champinohips. Next year, he said, will be his final season. Brit Mark Cavendish (HTC-Columbia), winner in his debut last year, lost contact with the favourites on the Cipressa climb, though he suffered two setbacks prior to the climb. “I did not feel too bad to start off,” Cavendish told La Gazzetta dello Sport. “At the bottom of Turchino, like the other day, I had the spokes ripped out of my wheel. I had to do a wheel change, I chased, right in the tunnel I got back to the peloton and there was a crash in the tunnel. Cavendish suffered from tooth problems this off-season and said that had he been able to start his season two weeks earlier he could have been competitive in today’s race. The race saw an early escape of three men attack at kilometre 1 and gain up to 21 minutes and 55 seconds. Their gap fell dramatically between the Passo del Turchino and the start of Le Mànie climb. Cavendish, Andy Schleck (Saxo Bank) and Damiano Cunego (Lampre-Farnese Vini) and many others lost ground to a group of 81 on the descent of Turchino. By the base of Le Mànie, the front three held one minute on the chase and one minute and 50 seconds to the Cavendish group. Cavendish and the others re-joined the front group after Le Mànie. With the front three back into the fold, it was ‘gruppo compatto’ ahead of the critical part of the race: I Tre Capi, the Cipressa and the Poggio. 10. Luca Paolini (Ita) Acqua & Sapone all same time. What makes Milan-San remo a great race? What makes Milan-San Remo a great race – and who will win?